Japanese light heavyweight legend. As Lyger, he's had short tours of CMLL (along with a 1994 AAA appearance and working AAA shows in Japan.) Had an extended stint in CMLL in 2010 as a top level rudo, feuded with La Sombra and Mascara Dorada both in Mexico and Japan. 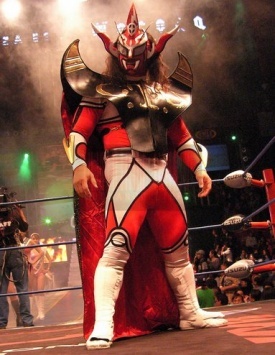 Returned to Mexico in 2011 as a tecnico. w/ Tinieblas Jr. & Rayo de Jalisco Jr. This page was last edited on 18 April 2019, at 15:28.